The Assassin’s Creed video game series has been around since Nov of 2007. It has seen numerous releases in video games, comics, and even a feature film. Fans of the series have been dedicated and committed, but in recent times the series has suffered from fatigue – with yearly releases of games, and an increasingly convoluted “present” storyline that take hints from the TV Series Lost, and asks more questions than it answers. In recent times, Ubisoft has decided to take a break, and there was a time increase for game releases. So why are we hyped for the new game coming out? Assassin’s Creed Origins will be the 10th game in the series, releasing Oct this year. Its predecessor was the decent Assassin’s Creed Syndicate. 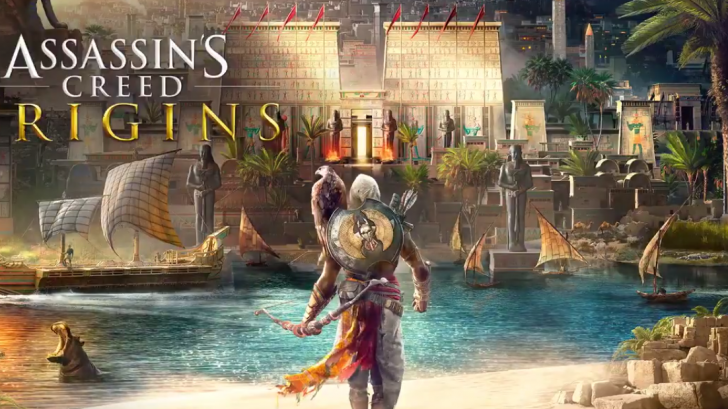 Origins is taking a cue from its name, and moving to the origin story of the Assassins’, back to Ancient Egypt. The Templar organization doesn’t even exist during this time, but the early ancestors do, and will serve as the primary antagonist of the game. This time period is quite exciting because it can showcase a lot of the roots to the Assassin’s and Templars, as it relates closer to the first societies detailed in the history displayed in previous games. We will get to see Egypt in its old glory, with interactions of vendors to royalty and get a real feel of the time period. As always, players will get to witness first hand actual world events and visit real locations. One of the systems with the series that has suffered fatigue has been the combat. Traditionally combat has been a lock on, predetermined set of moves either by attacking or countering. This suffered redundancies, and enemies became repetitive and boring. The combat system has been revamped in Origins, pitting the player against enemies with a new system of hits and misses. Combat will be more open and fluid, and interactions are on a wider scale. For the first time, the player will have a shield, so defensive combat will be more than just dodging/parrying/countering. As with all AC games, Origins it is an open world where you can roam around freely. Participation in various activities will return, including tomb raiding. A new Arena system will be introduced, with both play in the campaign and on free roam. The ability to participate in an arena or gladiator type fight will give players experience and unique weapons. Familiar themes will return, including riding ships and mounting horses. Plus we will get a detailed history of Ancient Egypt with extended insights to the beginnings of the conflict between Assassins and Templars. A new introduction to the series, players will have more RPG focused elements in the game. With the ability to level up – follow certain skills/traits to help them become the Assassin they want to be. Coupled with loot and drops from enemies, various weapons will be found and can attune to the player’s style of play. Items can be crafted, and they will all have different levels of rarity with different perks and bonuses. Skill trees will be prevalent, with XP earning points to place in the path of a stealthy assassin, distance assassin specializing in bows, or a head on/combat oriented assassin, bred for in your face direct fighting. This expansion on the core of the game will give players great flexibility to master certain skills. It also helps with replay value, letting players follow a different path and experience the game in a new light. Overall, Assassin’s Creed Origins turned lots of heads at E3 and beyond. Early play reviews state excellent graphics, player interactions, and general over all updates to this steady series. Are you a devoted AC player? What has been your favorite game so far? Are you excited about Origins? Make your comments below. And as always follow ThisGenGaming on Twitter @TGGamingReviews for all the news, reviews and commentaries in the gaming industry.